Compiled by Charlene Van Buekenhout from our friends at Wikipedia! Sunny days are up ahead, and that’s good news for a sundial. In honour of the upcoming clock talk “A Brief History of Time (Keeping)” on Sunday April 7th at 1:30 pm with Alexandra Kroeger, here is a list of some of our favourite mottos that are written upon the face of sundials throughout history. Be as true to each other as this dial is to the sun. Hours fly, Flowers die. New days, New ways, Pass by. Love stays. Self-dependent power can time defy, as rocks resist the billows and the sky. It's later than you think. Touché! This last one is my favourite for it’s bluntness and spookiness. For a longer list check out the wikipedia page on sundial mottos, and for time’s sake come to the talk on Sunday to learn more about the human obsession with keeping time. 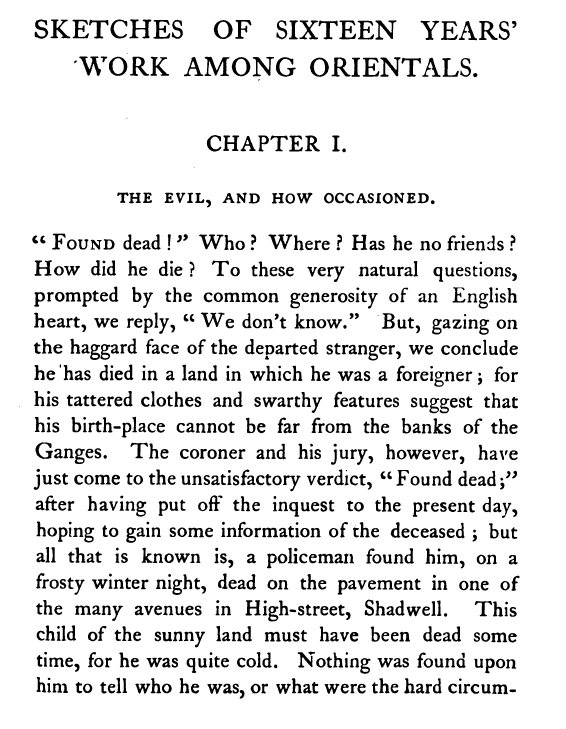 Excerpt from Joseph Salter, The Asiatic in England (1873). So writes Joseph Salter, a missionary who worked in London’s East End. In his first memoir, The Asiatic in England (1873), Salter reflected on the condition of labouring Indians in early 19th century London. In the early 1800s, thousands of Indian labourers were moving through the port of London. Lascars (Indian sailors), servants, and ayahs (nannies) signed contracts in which they agreed to work on board ships headed to English ports. On landing in London, though, too many discovered that guaranteed return passages to their port of origin were merely empty promises. Some weren’t even paid their wages. Not prepared for a prolonged stay in London, these labourers found themselves without food, shelter, or a way home. The issues of distressed Indian labourers, especially lascars, increased after the 1830s. For middle-class Victorians in particular, the presence of distressed Indians was alarming: how could there be distressed colonial subjects in the metropole? What did their condition say about Britain? What did this say about Victorians as good, Christians who were trying to “bring civilization” to the peoples they colonized? To tackle the problem of increasing and abandoned destitute lascars, members from missionary organizations established the Strangers’ Home for Asiatics, Africans, and South Sea Islanders. This lodging house opened its doors in the spring of 1857 after a year of construction. Initially, the institute was formed to provide a solution to lascars who were not adequately housed by the East India Company. As the administrators began their work, though, they realized that there were other labourers in similar conditions of distress. The Strangers’ Home thus became a space through which Victorians could provide “help” to working-class Indians. Sketch of the Strangers’ Home for Asiatics, Africans, and South Sea Islanders in Joseph Salter, The Asiatic in England (1873). To find out more about the Strangers’ Home and Victorians’ idea of “helping”, check out this Sunday’s lecture with Dalnavert’s very own Intern Curator, Rammy Saini! More details on her talk can be found here. Ruth O. & Rammy S.
On 21 December 1895, The Winnipeg Tribune ran an article introducing its readers to the newly constructed mansion of Sir Hugh John Macdonald and his family. Titled “A Perfect Home,” the piece described the lavish interiors of Dalnavert in impressive detail. Perfect, too, were the “arrangements for carrying on the work of the house,” particularly the heating system, laundry facilities, and kitchen. When praising the upkeep of the house, the article focused on the rooms themselves, failing to acknowledge the individuals who laboured in them every day. In celebration of International Women’s Day, we want to talk about the hard work and service of the female cooks and maids that actually kept the Macdonald family home in working order. When the Macdonald family moved in, they hired two women to live and serve at Dalnavert: the older, more experienced servant worked as the cook, while the younger served as the maid. While we know very little about the women who laboured at Dalnavert, we do know that one servant was named Mary Keith and that she moved into Roslyn Apartments with Lady Macdonald after the death of her husband. And we know that an earlier domestic servant had emigrated from Ireland. Most of the identities of the servants, though, remain buried in the past, along with their stories. What we can do is speak to the labour of these women. We know they lived and worked in the servants’ quarters of the home. Working from the back of the house – divided by doors and tucked away servants’ staircases – the cook and maid navigated the mansion as a near-hidden labour force. They could easily work 13 or more hours a day from sunrise to sunset, labouring away at the endless chores of laundry, cooking, and cleaning. Dalnavert’s kitchen, located at the opposite end of the house from the front entrance. The steep, narrow servants’ staircase, leading from the kitchen to the second floor. Ten meals to prepare beforehand, and not sure where there will be sufficient scraps for tasty rissoles or shepherd’s pie for lunches. It is bad enough to go to bed with three meals on one’s mind, but when it comes to a dozen, the weight is appalling. We also know that roughly 75% of women in the domestic service industry in Canada before the First World War came from the United Kingdom. Canada at this time had an immigration policy that drew in “suitable British single women, ages 17 to 35” (Library and Archives Canada). They were single because it was deemed not respectable for married women to labour for a wage—they were supposed to have their own households to manage. Perhaps to break away from the stereotypes of women’s work, Canadian women were moving away from domestic service—it did pay relatively well, but it was uninspiring work at a time when women were beginning to consider their own rights and independence. Women were seeking alternative occupations in industry and commerce. E. Cora Hind, for example, came to Winnipeg from Ontario in 1882 to seek work with The Manitoba Free Press as a journalist. After the company denied her a position, she learned to use a typewriter and went to work as Hugh John Macdonald’s secretary. In 1901, Hind was appointed as the agricultural editor of the Free Press, becoming the first female journalist in Western Canada. Yet even as a number of women sought employment in new industries, domestic service remained the main employer of female workers. As household technology changed, so did the lives of female housekeepers across Canada. Many innovations made domestic labour less time-consuming, less taxing, and less dangerous. The Kitchen Queen stove, for instance, featured a temperature gauge that no longer required the cook to stick her hand in the oven to determine its heat levels. Another innovation was the Warren Rotary Knife Cleaner, which greatly reduced the labour of cleaning knives by hand. Then there was the electric Beattie washer, an innovation that eliminated the time-consuming work of manually washing clothes. Even as these new machines eased the overall burden of work, they were sometimes seen as problematic in the hands of women. Some argued that these innovations would lead to female idleness due to their ease of use; one female education manual specifically warned against Rotary Knife Cleaners, claiming that their use would make women “inflexible and indifferent” housewives. There was, it seems, a perceived threat to the status quo, fearing what women would do if housework didn’t keep them preoccupied; they might read, enjoy a cup of tea, or fight for the right to vote! And then what would happen to men’s supper? Today, household technology continues to reduce the demands of domestic labour. Many of us have dishwashers and washing machines to do the bulk of the work. But does the responsibility of maintaining a household still largely fall upon women? Who does the dishes or the laundry at your house? From Charles Dickens’ Great Expectations to George Eliot’s Middlemarch, countless celebrated novels of the 19th century can still be found in bookstores today. If you were to crack open a modern edition of a Victorian novel, however, your literary experience would be incredibly different from that of 19th century readers. So how were readers consuming these stories when they were first published? And what makes them different from the novels sitting on our bookshelves today? Serialization meant that a novel was published in weekly or monthly instalments. Instead of buying a completed book, readers would purchase chapters or parts as they were released. (Think of it as watching a new TV series as it airs rather than binging an entire show on Netflix). Instalments of serialized novels were often published in periodicals or literary magazines. This format meant that texts were easy to carry around, easy to share with others, and more affordable – readers did not have to pay for a whole novel upfront, but could put a portion of their income each week or month towards these publications. Cornhill Magazine, for example, ran monthly editions for 1 shilling (12 pence), and the Dickens-owned All the Year Round ran weekly editions for only 2 pence. While serialized novels were largely marketed towards and consumed by middle-class readers, the twopenny weeklies of All the Year Round were also accessible to members of the working class. Serialized fiction was also known for popularizing the cliffhanger at the end of its chapters. Just as a cliffhanger makes you crave the next episode of your favourite TV show, it also incited Victorian readers to purchase future instalments of the novel they were currently reading. During the wait between instalments, readers would frequently write to one another with reactions to recent chapters; occasionally, they would even write to the authors themselves with their emotional responses. This reader-response phenomenon would sometimes prompt authors to change plotlines and introduce new characters based on the opinions of their readers. In this 1869 illustration from London Society, readers clutch their books outside Mudie’s Select Library in London. Wikimedia Commons. Many Victorian novels were published in three volumes, either as a first run or after serialization. These texts, known as “triple-deckers”, sold for 31 shillings, 6 pence. For reference, this price was more than the weekly industrial wage and was a deterrent even for middle-class readers. As a result, triple-deckers were bought by circulating libraries to be borrowed by middle-class readers one volume at a time. Through a circulating library, consumers paid about 21 shillings (1 guinea) a year in subscription fees and in doing so, were able to borrow one volume of a novel at a time. This option was much cheaper than purchasing one or more triple-deckers. Mudie’s Circulating Library, based in London, and W. H. Smith’s Subscription Library, established across British railways, dominated this industry in the Victorian period. While the three-volume novel eventually declined in popularity towards the end of the 19th century and was replaced by texts of varying lengths, circulating libraries remained the principal means of borrowing books into the 20th century. After serialization or three-volume publication, novels were typically re-printed in single-volume format for about 3 ½ shillings. By the mid-19th century, these stand-alone texts became even cheaper through their publication as 1 shilling “yellowbacks” (named as such because they were bound between two boards covered in yellow paper). Yellowbacks made popular texts more accessible not only because they were more affordable for the working class, but also because they were distributed in railway bookstalls throughout the country. By the late 19th-century, yellowbacks were largely replaced by paperback novels, a format that is still purchased to this day. While the decreased price of yellowbacks allowed working-class readers to enjoy re-prints of popular novels, lower-class audiences were also the primary consumers of sensational adventure novels known as “Penny Dreadfuls”. As the name suggests, these stories were sold for only a penny and were published in instalments on cheap pulp paper. Tales would often unfold over months or even years and would feature monsters, detectives, kidnappers, highwaymen, and plenty of other gruesome and Gothic figures. Penny Dreadfuls were particularly popular among working-class youth, and by the 1880s their avid consumption instigated a “moral panic” among middle-class Victorians. Many believed that the “scandalous” content of Penny Dreadfuls would lead lower-class youth into a life of degeneracy and they blamed the novels for inner-city violence and crime. In reality, this misguided middle-class concern was based less in truth and more in the fear of an independent working class that did not adhere to the upper classes’ moral expectations. Ehnes, Caley. Victorian Poetry and the Poetics of the Literary Periodical. Edinburgh Critical Studies in Victorian Culture. Edinburgh: EUP, 2019. Ruth O. and Rammy S.
While these cheesy yet sentimental lines could easily turn up in any Hallmark card this Valentine’s Day, they are actually from a 1906 Vogue magazine (New York) courtesy of E. P. Dutton & Co. The tradition of exchanging cards on Valentine’s Day reaches back to the mid-19th century. The commercialization of this holiday can also be traced back to this period and to the establishment of the “Penny Post” in 1840. As the British postal industry adopted prepaid postage stamps that could reach anywhere in the country for one cent, companies began to mass-produce Valentine’s Day cards. The Penny Post made exchanging these holiday greetings affordable and convenient for all. By 1903, the trend was to send leather postcards to one’s sweetheart. The most popular leather cards were made by W.S. Heal. His cards contained humorous and romantic messages. Images were burned on these leather postcards with colour added afterward. Thanks to the thickness of these leather love-notes, the trend came and went quickly as they jammed postage machines. The US post office banned them in 1907. While the phrase on this postcard might give you flashbacks of Stacey Q’s 1986 one-hit-wonder or one of U2’s lesser-known tunes, let it be known that W. S. Heal said it first. Reverse of postcard with the lucky lady’s address (that’s King Edward VII, Queen Victoria’s son, on the stamps). Free visitor parking is available in our parking lot located to the left of the Visitors' Centre. Due to its historic nature, the second and third floors of the Museum are not wheelchair accessible.